12 Facts About Pizza | Eat This! Who doesn’t love pizza? Here are 12 facts about pizza. The first pizzas were just dough and tomato sauce – no cheese. Antica Pizzeria was the world’s first pizzeria. It opened in Naples, Italy in 1738. 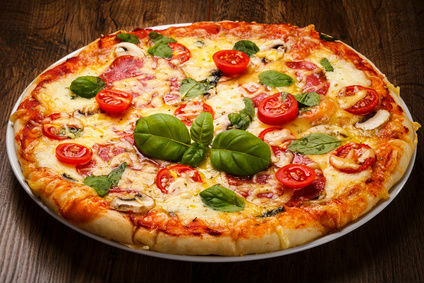 It wasn’t until 1889 that cheese was first added to pizza in Italy, when famous pizza chef Raffaele Esposito made a pizza for Queen Margherita using tomato, basil, and cheese to represent the colors of the Italian flag. Today, the simple margherita pizza remains one of the most popular pizzas in the world. The most pizzas are delivered (and eaten) on New Year’s Day, New Year’s Eve, Halloween, Thanksgiving Eve, and Super Bowl Sunday. Know someone who loves pizza? Check out our 10 Gift Ideas for Pizza Lovers article for some awesome pizza-related gift ideas.